Valeri moved in front of NYCFC’s David Villa for most goals this season with 20. The Argentine midfielder scored on a penalty kick in the 15th minute to extend the streak. Fans chanted “M-V-P! M-V-P!” after his second goal in the 59th minute, which put him in the lead for the Golden Boot award. 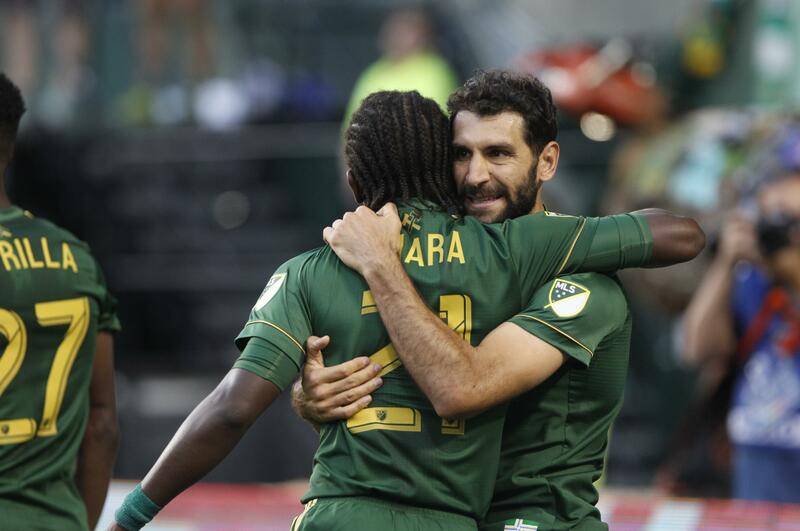 The Timbers, who started the day in third place in the Western Conference behind Vancouver and Kansas City, won their fourth straight at home. Orlando City’s chances of making the playoffs grew slimmer with the loss. The slumping Lions, who have won just one game in their past 11, were in second-to-last place in the East. The team won six of its first seven games of the season. Toronto FC and NYCFC have already clinched playoff spots. After Valeri’s early penalty kick, the Timbers pushed the lead on Darren Mattocks’ goal off a cross from Dairon Asprilla in the 30th minute. It was Mattocks’ third goal of the season. Jonathan Spector was sent off in the first minute of the second half after his second yellow card of the game for a foul on Valeri, and Orlando was down to 10 players. After Valeri’s second goal, the match got chippy with some shoving as Orlando set up for a free kick. Victor Pagliari Giro was sent off in the 85th for appearing to elbow Portland’s Diego Chara in the face. The Lions were reduced to nine players the rest of the way. Valeri has scored more goals than any other Timbers player across all eras. The game featured the newest Timber, 5-year-old goalkeeper Derek Tellez, who was signed to a one-game contract to grant his wish with Make-a-Wish Oregon. Tellez, who has had three surgeries for a cancerous brain tumor, got a rousing ovation from fans when he was introduced as a sub on the video scoreboard. He also stood with the team during the national anthem and posed for the official match photo. On Friday he practiced with the team. Kansas City 2, Los Angeles 1: Daniel Salloi and Diego Rubio each scored in the first half, and Sporting Kansas City (12-6-11) beat the Galaxy (7-17-6) in Kansas City, Kansas, to move within one point of first-place Vancouver in the Western Conference. Kansas City, which won the U.S. Open Cup on Wednesday, extended its club-record home unbeaten streak to 24 games. Los Angeles hasn’t won an away game in the series since 2007. Salloi opened the scoring in the 18th minute on a calm redirection of Rubio’s cross. Rubio made it 2-0 in the 35th. Seth Sinovic ran past the defense for a through ball and crossed it to a wide open Rubio for an easy finish. Romain Alessandrini bent in a free kick in the 58th for Los Angeles. It was the first time this season Sporting KC allowed a goal directly from a free kick. Sporting KC had some chances to make it 3-1. Graham Zusi’s deflected shot in the 65th came back to his feet and his second attempt from close-range was denied by Clement Diop. Ike Opara’s open header at the end of Zusi’s corner kick sailed wide in the 67th. Atlanta 2, Montreal 0: Hector Villalba and Jeff Larentowicz each scored, Brad Guzan had his second straight shutout, and host Atlanta (14-8-7) beat the Impact (11-13-6) to extend United’s home unbeaten streak to 12 games. Atlanta moved into third in the Eastern Conference, three points back of playoff-clinching New York City FC. Montreal trails the New York Red Bulls by three points for the final playoff spot. Villalba opened the scoring in the 28th minute with a long-distance shot for his 12th goal of the season. Larentowicz scored his first goal for Atlanta in the 73rd by knocking in Julian Gressel’s cross. Gressel’s eighth assist of the season is the second most for a rookie in MLS history. Montreal goalkeeper Evan Bush faced intense pressure for much of the match. On the offensive side, the Impact’s best scoring chance came in the 72nd minute on Michael Salazar’s close-range shot on a breakaway but Guzan stayed low to defend the near post. Published: Sept. 24, 2017, 10:42 p.m.